Pizza Hut is planning to expand its services out of Colombo soon. There are around 20 outlets in the country and the management hopes to double it by 2015. Addressing the launching ceremony of 'Hot Dot' yesterday at the Pizza Hut, Marketing Director Ramzeena Lye said they are planning to open outlets in Galle, Gampaha, Kurunegala and in the North and the East within the next two years. She disclosed that sales of Pizza Hut has increased by 30 to 40 percent with the ending of the civil war in the country. "Pizza Hut in Sri Lanka is expected to be named as the best performing market in the world for Pizza Hut with two million pizzas being sold every year and we are taking steps to increase sales," she said. "Our main challenge is to cook best quality pizzas for reasonable prizes and later we will introduce pizzas with affordable prices, she said. Pizza Hut launched its latest home service named Hot Dot Challenge at their Union Place outlet to provide better service for its customers. Pizza Hut CEO Yasa Nadarajah said that they are known for consistency high standard of food quality and efficiency in delivery. Commenting on the HOT DOT concept he said the pizza box comes affixed with a heat sensitive sticker. "This sticker is black at room temperature. When placed on a hot pizza the sticker absorbs heat from the pizza and turns white with the word hot written on it. The sticker will read hot for as long as the pizza is hot," he said. "The Hot Dot has been successfully adopted by Pizza Hut in many countries across the world and we thought it is the ideal way to give the Sri Lankan consumer a tangible and measurable way to gauge our promise on delivering hot pizza", he said. Pizza Hut is the local franchise of the world's leading pizza restaurant brand. Pizza Hut is a subsidiary of Yum! Brands, Inc, which is the world largest restaurant company. There are more than 6000 Pizza Hut restaurants in the United States and more than 5600 stores locations in 94 other countries and territories around the world. The target group of the Pizza Hut is families and the young generation between the ages 20 to 29. 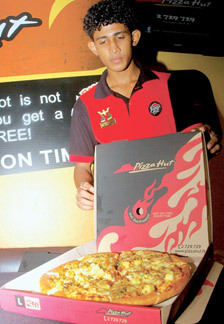 The Pizza Hut has been providing its services to the Sri Lankan customers for 18 years.